Swimming Pool Heat pumps are a super-efficient way to heat your pool. They make full use of advanced refrigeration technology to capture the heat in the outside air and transfer it to the pool water. Paramount Pool Products Ltd is the UK sole importer for Waterco heat pumps. Please click on ‘find a local dealer’ for your nearest supplier. Swimming pool heat pumps do not generate heat; they simply capture it and move it from air to water thus providing an efficient and environmentally friendly system for heating your swimming pool! You will enjoy your swimming a lot more. Warm water is inviting as opposed to cold, swim in comfort throughout the whole season. Extend swimming season. Why use your pool for only two months of the year when you can use it regardless of the weather? Automation. Set your temperature and let your heat pump do the work. Efficiency. Our systems are designed specifically for swimming pools which means that the components used offer maximum efficiency. Does a swimming pool need a heat pump? In the UK all swimming pools should utilize a heat pump, either air source or ground source, regardless of whether your swimming pool is above or inground. Heat pumps are inexpensive overall. They are reasonably priced, easy to install and maintain and an essential item. Having a garden pool may be aesthetically pleasing to the eye but if the water is not warm and inviting you may not want to use your pool as often as you could. How can I heat my swimming pool? This is a question that lots of people ask. Generally, the main heating systems available for swimming pools are Gas (LPG or Propane), Electric or Oil heaters. Some of these heaters can be beneficial from a cost point of view but tend to lose their appeal when it comes to installation (and running) costs and this is why a air source or ground source heat pump can be a much better solution to heating a pool. Essentially the process is similar to the way a refrigerator works. Heat is draw from the environment surrounding the heatpump which is then turned into heat for your pool. 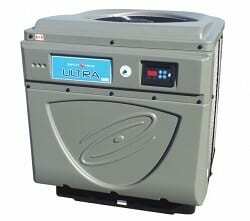 How efficient is a water heat pump? They don’t have a simple efficiency number to work with. Their efficiency is measured by Coefficiency of Performance (COP). COP averages at 5.25 across the range. This means that for every unit of electricity that you put in to run the compressor, you can obtain up to 5.25 units of heat out of the heat pump. *COP is dependent on a number of factors, i.e water temperature, air temperature and relative humidity. For further information about how swimming pool heat pumps work please click here. To calculate the size of the heat pump you require please click here. To see our swimming pool heating section please click here.